Sardar Patel was one .of those who' inspired me to a life of social service and dedicated work. 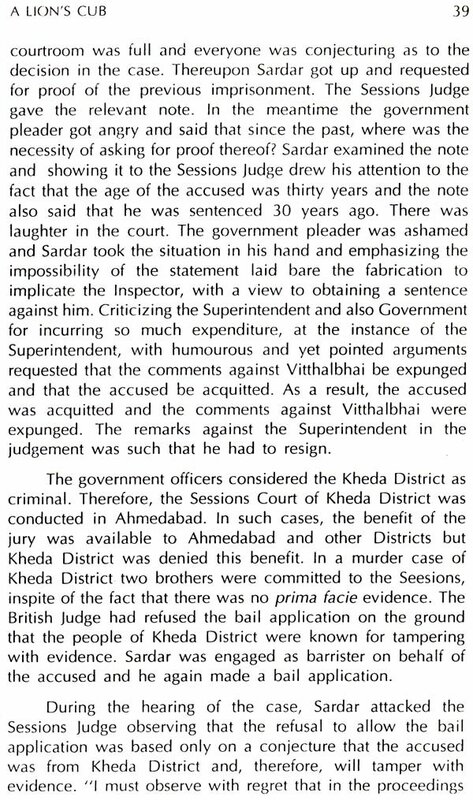 As a tribute to him as well as to provide young people with an ideal, I wrote his biography in Gujarati. The same was very well received and later was translated into Hindi. When therefore, I received an invitation from the Publications Division, Government of India, for writing the same in English, I readily accepted as it was a golden opportunity to let the Great man be known to a wider reading public. He was a pillar of strength to India and will be always remembered for the unique and unparalleled services he rendered to the nation. He was great as a freedom fighter and proved himself greater as a statesman and administrator. He was a man of rare qualities, the like of him, it is difficult, to decipher. But for the incessant and untiring assistance given by Sarvashri V.J. Trivedi and H.K. Solanki, I should admit, it would not have been possible for me to have this English version ready in its present form. I cannot forget the assistance of Shri B.T. Pathan, who sacrificed his moments of leisure to prepare the manuscript. I am thankful to Prof. Mohanbhai Patel who scrutinised the manuscript in its final stage and made important suggestions. I am grateful to the Publications Division for entrusting me with this biography. THE HISTORY OF INDIA would have been differently written had Sardar Patel not been the Deputy Prime Minister when India became independent in 1947. The triumvirate, Gandhiji, Nehru and Sardar Patel - the benevolent triumvirate it has been often called - was responsible for giving direction to the destiny of the country. Gandhiji won the independence for the country, Pandit Nehru gave foreign policy a shape and strength and Sardar Patel consolidated the country into one united whole in a unique manner. A man of iron will and absolute fearlessness, Sardar Patel set about the task as Home Minister without fear or favour. He was one of those few men who knew what he wanted and knew also how to get it. A man with a superb knowledge of human nature - its strength and its weaknesses and an uncanning perception for sizing up human beings - Sardar Patel tackled the question of 550 and odd State territories and principalities in a masterly strategic manner which left even his wildest critics in complete amazement. Almost within a year he redrew the map of India with every princely State joining the Indian Union and thus forming part of the political stream of life that was endowed with unity as it was already endowed with a cultural unity and harmony. Even if Sardar Patel had not done anything else, his name would have been written in golden letters in Indian history for the future generations to take inspiration from. The surprising fact is that even though he took away everything from the Princes, the Princes never complained of any ill-treatment or any injustice from a person who never spared them from trenchant criticism all his life. On the contrary they praised with one .voice the generosity Sardar Patel had shown to them in manners, political, financial and 'so on. Whether he was a king of a big State or small, he treated each of them with kindness, consideration and fairplay that captivated the hearts of all those who came to scoff but remained to pray. Sardar's greatness lay in the fact that his sworn enemies turned into the most trustworthy admirers. 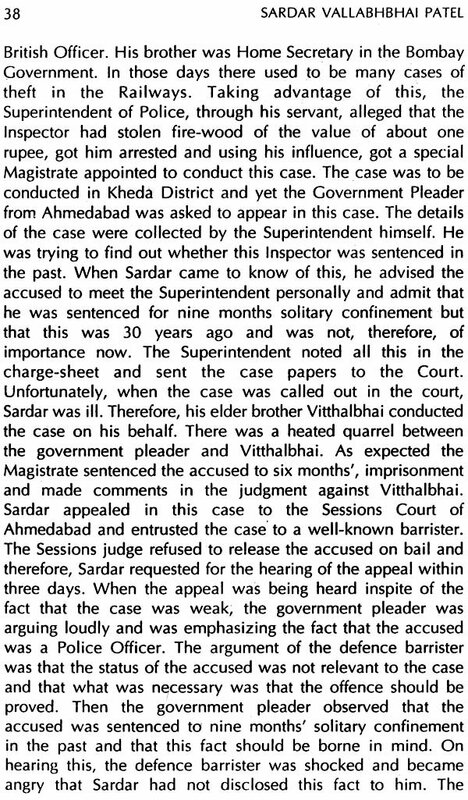 But Sardar Patel had other facets of life which are equally inspiring and worth emulating. His physical courage at the time of his operation has very few parallels in the history of this land. His sacrifice of his legal practice and the power and the position that accompany such practice, can be a torch-bearer for anyone who wants to serve the nation. 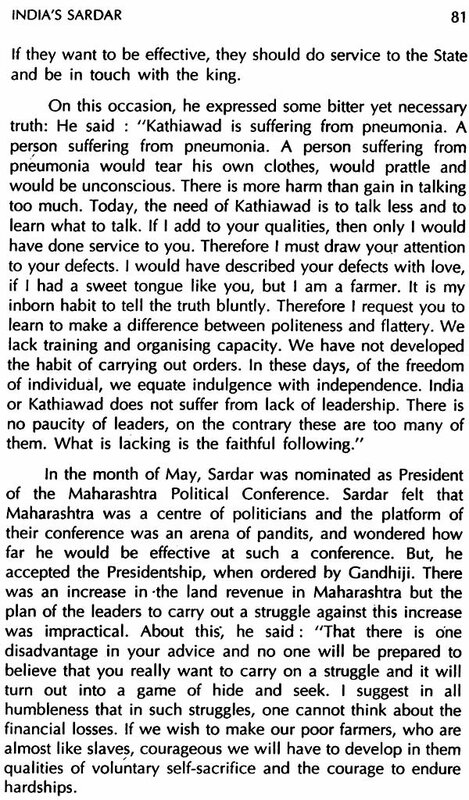 But apart from his personal attributes, the integrity and singleness of purpose with which he served the cause of the farmers at Bardoli and Ras and other places is equally admirable. 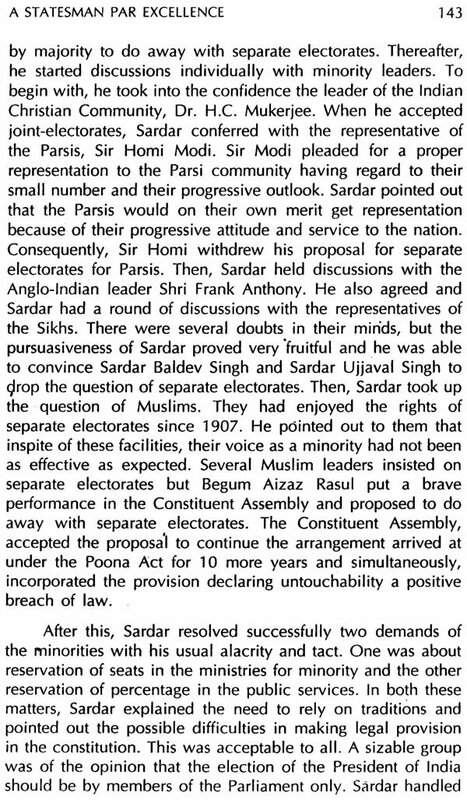 The Sardar had an iron determination which enabled him to see clearly the goals that the nation should have for itself. As a peasant, he was a realist par excellence. He went to the heart of the matter and wasted no time in searching the core, the centre of the problems that affected the country. His insight was clear; his understanding precise; his method straightforward. Naturally he could solve the problems of the farmers even with the British in a manner which left the foreign rulers agape. 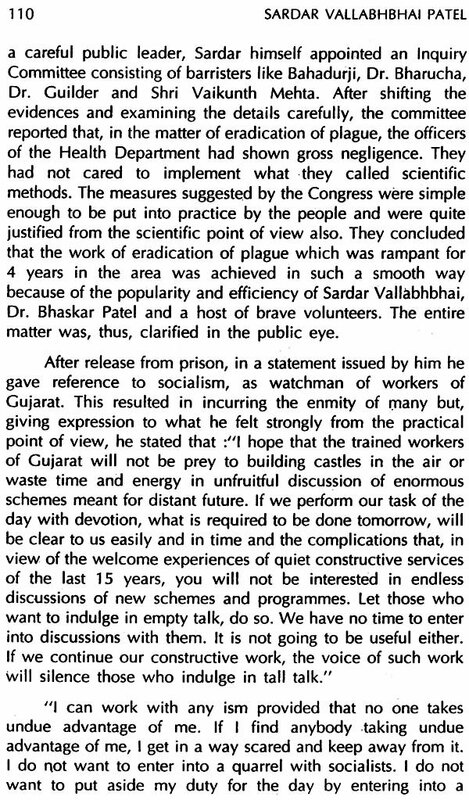 Anyone who studies the history of the peasant movement in Gujarat will be convinced that, but for the' extraordinary practical vision and perspicacity of Sardar Patel, the movement would have floundered. Not only was he courageous, he inspired courage in others. Not only did he resist the British in the tax collecting campaign but he convinced the farmers, that their development lay in resisting it. And he organised this struggle in a manner that brought complete victory to the farmers. 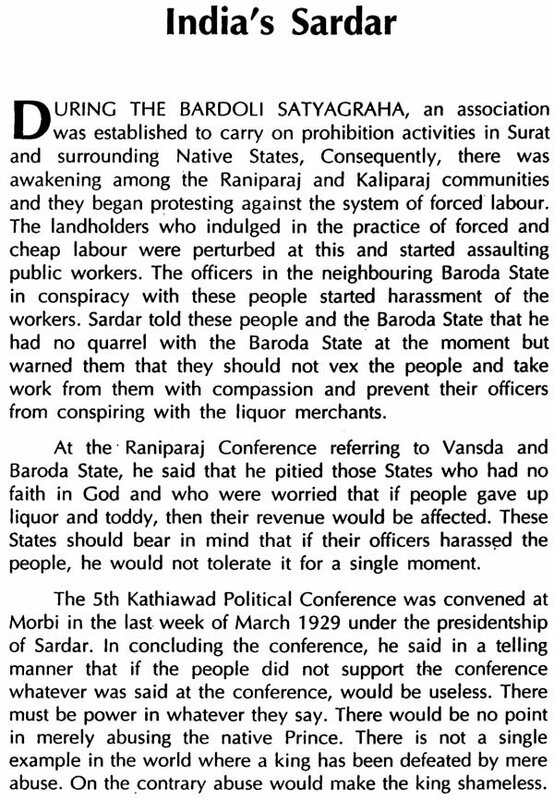 It was in this struggle that the organisational capacity for which Sardar Patel became famous in the whole country was visible. 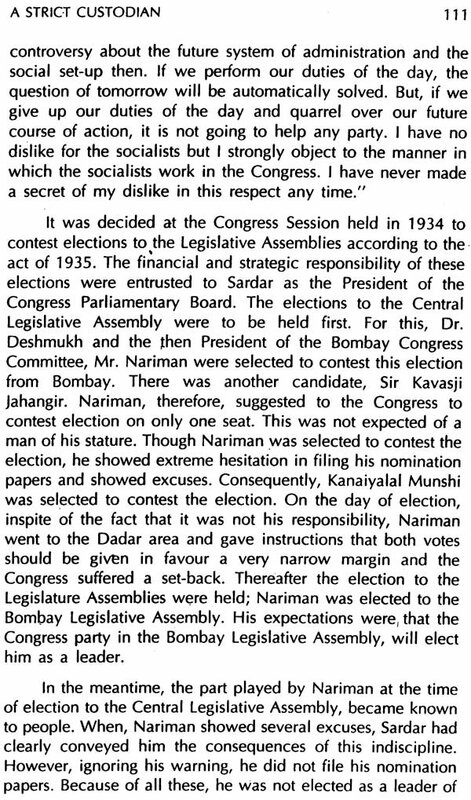 There was hardly a problem which the Congress faced and which could not be solved by Sardar Patel quickly and skilfully. He knew where to yield just as he knew also where not to give-in. This ability to give and take, is a characteristic of his whole life. But this 'give and take' was never at the cost of a principle- or the organisation he served or at the cost of integrity. He was equally concerned with the manner of granting things as also the way in which he got things done. He trusted the trustworthy fully and they in turn reciprocated the trust by giving a life-time bond of love and readiness to sacrifice. And by happily blending trust and honour, the Sardar could achieve a firm organisation and lay the foundation for the Congress as well as for the country. 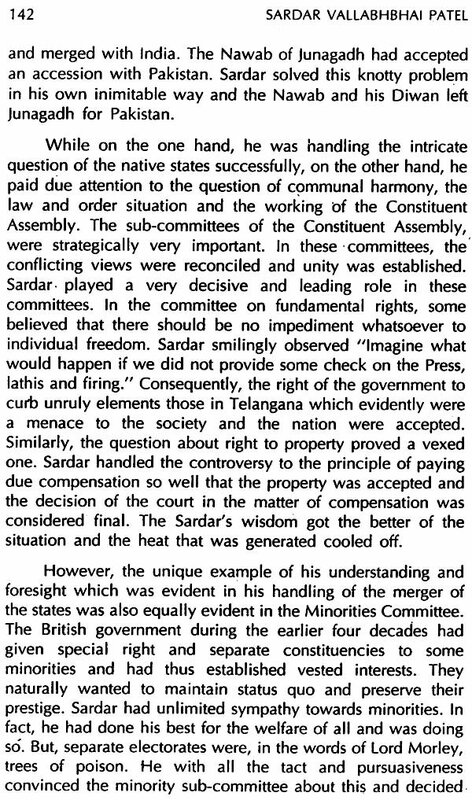 It was often said that the Sardar was ruthless but he was ruthless only when situations required it, otherwise like all great men, he had a heart of gold, whether in peace or in struggle, whether at work or at leisure, the Sardar rarely forgot the common men and women whom he knew, whom he loved and whom he trusted. Whether it was bringing up of a friend's son or getting work for the son of his office clerk or looking after the health of his relatives or sending in a telegram of congratulations on the marriage of a friend's daughter - in all these the Sardar showed his humanity and his love for the people. Stern in appearance and rugged in countenance, the Sardar could, only if he would, inspire fear in others. But that was not the way he worked. He always tried to convince others as he did not tackle any problem in a light-hearted manner. He took the problems of the country seriously and his only aim was to see that the country which was already partitioned, remained intact and this he achieved gloriously.